On Wednesday, the 4th edition of the BRP-Cascades golf tournament took place to benefit the Fondation du CHUS. Once again this year, it was a record-setting event, with proceeds totalling $1,903,378. It is the largest event to be held in benefit of the Fondation. Because we know that our health depends on keeping the planet healthy, Cascades, in addition to providing the event with financial support, decided to green things up and make the event an eco-friendly one. The measures were verified by the Conseil québécois des événements écoresponsables, and earned a Level-2 rating according to standards set by the Bureau de normalisation du Québec. A Green Team composed of 10 people was on site to raise awareness among participants about sound waste management. 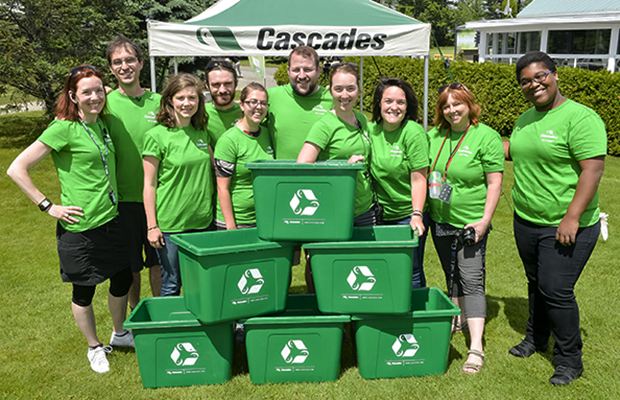 A partnership with Festivals et événements verts de l’Estrie (FEVE) allowed us to recruit new members for the Green Team. 872 kg of waste was diverted from landfill, for a waste recovery rate of 97%. 100 trees were planted in Magog in collaboration with Compensation CO2 Québec. The trees were more than enough to offset the 15 tonnes of CO2 generated by the transportation of participants. The use of reusable water bottles and water stations cut down on the use of single-use water bottles. Water-saving measures were publicized (hourglasses to limit shower times at the end of the tournament and aerators to reduce water flow in the bathroom sinks). A new initiative this year: we asked several passersby to contribute to expanding Cascades’ initiatives by promising to adopt new daily habits that will help green up the planet. Here is what Mario P., Mario L., Pierre, Micheline, Johnny, Robert, Stéphan, Jean-Yves, Philippe-Hugo, José and Alain said. Thank you for being good sports and playing the game! Finally, our environmental expert Jean-Sébastien Busque had fun presenting the green initiatives implemented at the tournament in his segment “Top chrono 2:30.” Here’s the result!